Located in the centre of the Crete Island, Albatros Hotel Hersonissos is one of the most sought- after hotels by tourists as it gives an easy access to many historic and popular sights of the island such as the plateau of Lassithi, the picturesque towns of Elounda and Nikolaos and the Minoan palaces of Festos and Knossos. 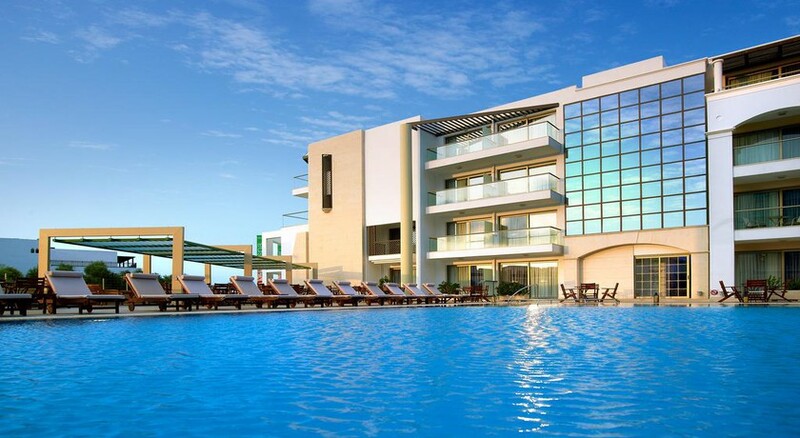 Albatros Hotel Hersonissos features a wellness centre, two restaurants and two swimming pools. The hotel offers a 5-star accommodation at just 20 meters from the beach. Albatros Hotel Hernissos is just at a two minute distance by walk from the beach on the Sea of Crete. It is a contemporary property. The guests can spend a full day of leisure at the Acqua Plus Water Park at 6 km from here. 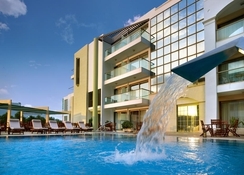 Albatros Hotel Hersonissosis located at a distance of 20 meters from the beach. Guests can reach here via the Chania Airport at 130 km and the Heraklion’s airport at 37 km. At around 350 metres, there is a bus stop which connects to the main Cretan destinations for the tourists. The Hersonissos town is at a distance of 5km from here. 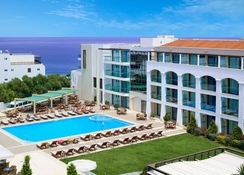 Albatros Hotel Hersonissosis has 92 standard rooms, 15 family rooms and 99 superior rooms for the guests to choose from. The luxe hotel has all the modern amenities to make your stay comfortable and luxurious. The standard rooms offer an en-suite bathroom, safe deposit box, hairdryer, satellite TV, mini-fridge, Wi-Fi, air-conditioning and a terrace or balcony. The superior rooms offer sea views or pool views with additional slippers and bathrobes. The family rooms are equipped with two separate bedrooms with a sliding glass door. The main restaurant here serves sumptuous Mediterranean and International cuisines in a buffet style. The stylish Daphne restaurant serves Cretan dishes prepared with fresh local produce. The hotel also has a lobby bar and an inviting seaside café. The Prova wine bar serves exotic local wine varieties. Guests can also avail information on Cretan wine tradition, varieties and wineries from here. There is a fun wine tasting event on Tuesdays for the guests. Greek cooking lessons are offered on Thursdays. Albatros Hotel Hersonissosis has 2 outdoor swimming pools with water-jets and a children’s pool with sun-terraces furnished with umbrellas and sun loungers. The property provides a salon for grooming and a wellness spa and fitness centre. A kids’ club comes up seasonally for the entertainment of children. For other recreation needs, the resort provides table tennis, billiards, internet corner and electronic games. The hotel was great, the staff were very friendly. Stand out people were Nikos, the night receptionist, Giorgos, Strathis and Lefteris. Great people and made our holiday so much fun giving us advice on good places to go. The ladies that cleaned the room were fantastic and so friendly to us too.